This year, once again, we go around the world – in more than one sense – to bring you news and stories about rhododendrons. Jeff and Gill Jenkinson recount their experiences on a spring trip to the USA to attend the 2012 National Convention of the American Rhododendron Society and Azalea Society of America, and tour the botany-rich Appalachians, with their abundant native rhododendrons. Jeff also contributes a piece about R. catawbiense. During the same time of year Jenny and Ian Chalk visited gardens in the UK, and in their article they discuss a number of those they chose to see. At our invitation, Marc Colombel offered an article, which we’re pleased to include, on using peat as a propagating medium. Marc runs a website, as a personal project, dedicated to all things rhododendron from his home in France (there’s a link from our national website – should you visit you’ll see that you click on a Union Jack to access the captions in English). Neil Puddey returns to our list of contributors with a follow-up to his stories in Vol. 47 2007 and Vol. 48, 2008 about the foreshadowed adoption of vireyas for display in the Gardens by the Bay horticultural park planned for Singapore. The 0.8 hectare Cloud Forest Conservatory in the park, which will maintain a cool tropical mountain climate, is now the home for vireyas supplied by Neil. He tells the story of their export in his article. The park sounds very interesting – reason to consider a Singapore visit, perhaps? We’re also most pleased to include The Jury vireya legacy by Abbie Jury, republished with her kind permission and likewise that of the Royal Horticultural Society UK, which first published this article in Rhododendrons, Camellias and Magnolias 2012. I should like to record my gratitude to Honorary Editor of the RHS Rhododendron Camellia and Magnolia Group, Pam Hayward, for her kind assistance in facilitating republication. Still on the subject of vireyas, we’re grateful that Andrew Rouse continues to provide meticulous reports on the results of his hybridising work with vireyas – this time discussing interesting results from crosses made with (R. macgregoriae x R. rubineiflorum). Back home, Lesley Gillanders chronicles a ‘moving home’ story. Lesley and husband Ken decided to ‘downsize’ to a smaller home and garden, but took a considerable slice of the latter with them – and their ensuing saga of heroic proportion makes a good read. Dedicated gardeners don’t surrender quietly! 4 The Rhododendron Of course, Ken also found time still to look after registrations for new hybrid rhododendrons. Whilst talking of Ken and Lesley, perhaps like me you were fortunate enough to see the ABC TV ‘Gardening Australia’ episode earlier in the year where they were able to show and talk about numbers of the fine plants that they had collected over the years on travels abroad and brought into their garden. And whilst on the subject of ‘Gardening Australia’, it was also nice to see that the National Rhododendron Gardens, Olinda, received some positive coverage last autumn, with presenter John Patrick interviewing the Parks Victoria NRG team leader Glenn Maskell about the very fine collection of ‘autumn interest’ trees in the Gardens. 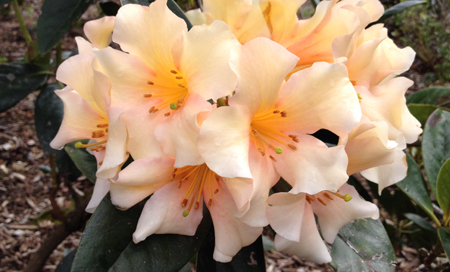 Readers will have noticed that last year we included a report by the Blue Mountains Rhododendron Society (BMRS), a New South Wales group with kindred interests to the Australian Rhododendron Society. This year, in addition to BMRS, we also carry a report from Tamborine Mountain Botanic Gardens, situated in southeast Queensland, which incorporates a Rhododendron Garden containing vireyas and an enthusiastic volunteer group having strong interest in vireyas. We’re pleased to welcome them to our pages.